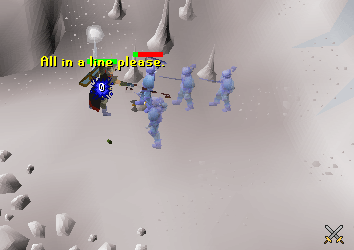 Ice warriors and giants are great NPC's to train on, especially if you are limited on cash. They can drop items such as armor (up to Mithril), law and other runes, gems, herbs and coins. They are also good charm droppers. Even if you aren't looking for a way to make money, these guys are excellent to train on! When slaying Ice Giants and Warriors, make sure that you wear armor that's Adamant or better. Ice monsters can be dangerous if you are unprepared. At least full adamant armor. Rune or Adamant chainbodies, medium helmets and shields are also acceptable choices. 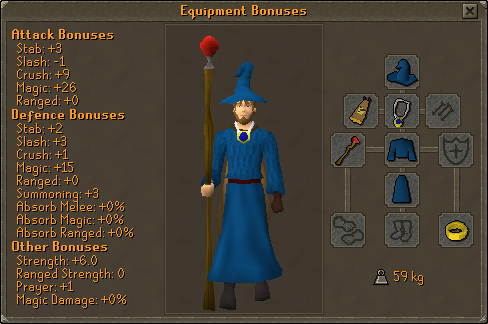 Wear anything else you want that doesn't give a negative stat bonus. 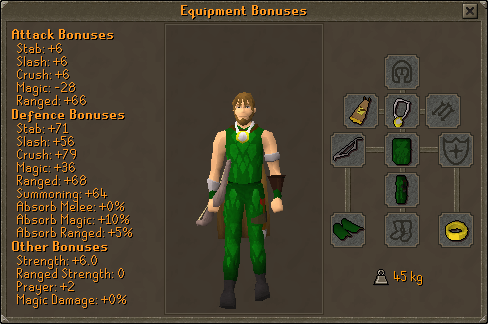 Fist of Guthix Gauntlets are recommended, but regular gauntlets or gloves are okay as well. Have about 1,000-2,000 Air runes and half as many Mind runes. Studded Leather Armor or Green Dragonhide. About 1,500-2,000 arrows; Iron is the recommended arrow. These pictures are just for visual aid. You don't need to have the exact amounts; it's just to give you an idea. Your inventory should only consist of food. These guys aren't too tough, so even if you are a member, it isn't recommended you bring potions. You shouldn't even bring that much unless you are lower than their combat level. 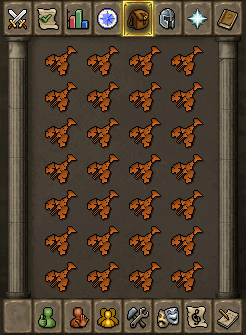 If you have a lower combat level then you should have better food like lobsters. If your combat is over the ice warriors then tuna or Salmon should be okay. If you are lower than their combat level then you should bring lobsters or even swordfish. You don't even need to bring that much food, unless you are a lower level (below their combat level). When doing this, your combat should be 40 at the bare minimum, but I would recommend at least 50 combat before trying this. 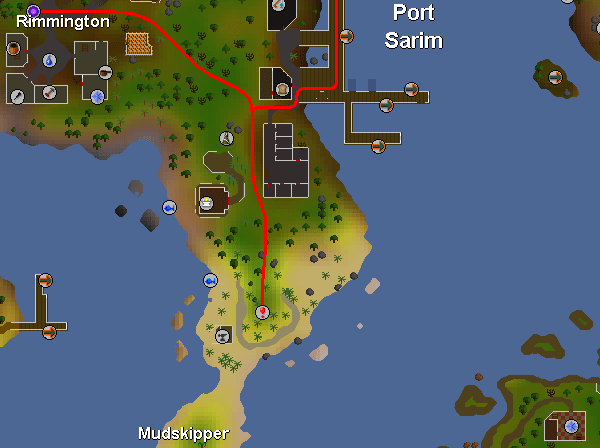 The Ice Cavern is located a short distance south of Port Sarim, and just north of Mudskipper Point. This is one of the most popular locations for training on both Ice Warriors and Ice Giants. The entrance to the cave should look like this. You may remember it from the Knight's Sword Quest. 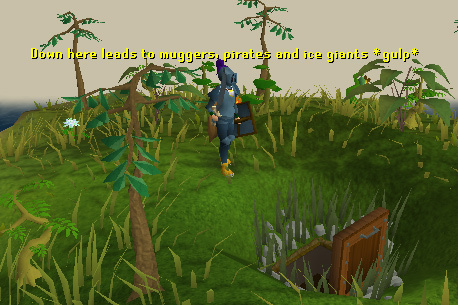 Run past the muggers and pirates and take the east route to the Ice Giants. 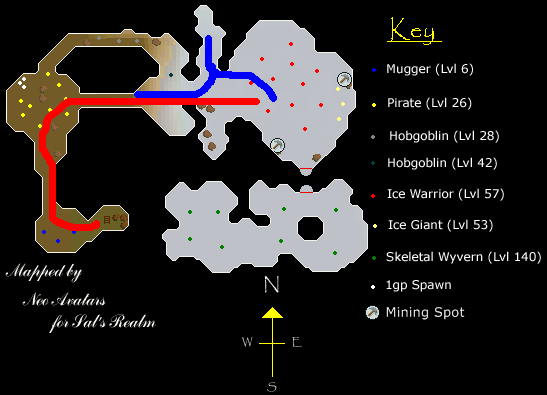 There is a safe zone just past the hob-goblins and right before you see the Ice Warriors and Ice Giants! Make sure you are at full health and go teach those Ice Warriors and Ice Giants a lesson! If you are a lower level you would probably want to use 'Block' instead of training attack because they can hit pretty high! Ice Giants are actually a lower level than the Ice Warriors but they have a higher Defence level. I would recommend starting with the Ice Warriors first, then trying the Ice Giants. 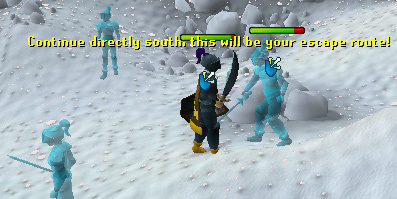 The ice warriors may be easier because they have a lower Defence level but they do have a higher attack level. If you are above 60 combat, you can go right to killing Ice Giants. If you are low on food just re-stock. It is okay if you have some food left over; you might die on the way back! When you run out of food, go back the way you came and go to the Falador Bank to re-stock on food and store your treasure. First, head to White Wolf Mountain, located northwest of Taverley. While there are Ice Warriors located on top of the mountain, the best place to train is inside the mountain itself. 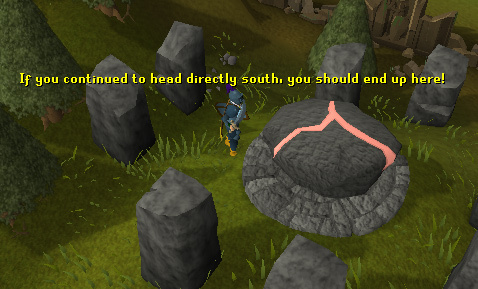 Note: This area is not recommended for players with a combat level below 60. That is what it will look like; as you can see, Ice Warriors! When you get inside white wolf mountain, there should be many ice warriors. The Ice warriors are vicious. Try and get them into a line, so you can attack them one by one, and avoid using precious food. 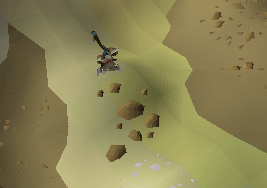 Ice Warriors and Ice Giants can also be found in level 44-48 wilderness. 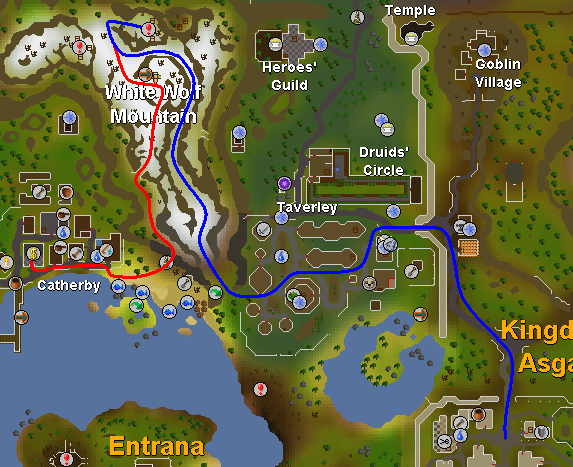 You can start by banking at Edgeville, and then heading as west as possible, and finally heading north. The entire route up should be a single combat zone. Be sure to avoid the area around the altar as it is multi-combat. When you get to the Ice Warriors and Ice Giants, it looks like winter. 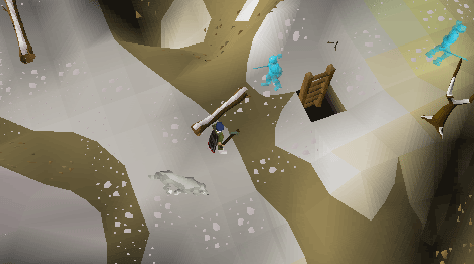 If you are a member it will look similar to the entrance of the God Wars Dungeon. There you will find Ice Warriors, and to the north you will find Ice Giants right against the fence separating the members area from freeplay. 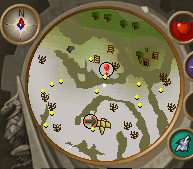 Because this area is in the wilderness, you may run into a PKer. If you do, refer to the escape route below. Cyan Route: This is the route you should follow if you are attacked. Red Circle: Inside this area is a multi-combat zone. It is imperative that you stay out of this area at almost all times because in it you can be attacked by more than one person. Only enter it to recharge prayer. Green Circle: This is a Wilderness Beacon. Although it may seem useless to Ice Giant and Ice Warrior hunting, it can prove useful. It is a place to escape if you are low on food. You cannot climb up the ladder to the beacon if you are being attacked, but you can use it if you are being chased. It is also a good place to log in. Surprisingly, both freeplayers and members can repair and climb up the ladder to the beacon. Requirements to fix the ladder are 70 Smithing or 59 construction and 2 iron bars and a hammer or 2 planks, 4 nails, and a hammer. This area provides certain advantages over the other areas. It is the only area where you can attack a large amount of Ice Giants without being attacked by Ice Warriors. It is also close to a Prayer altar. 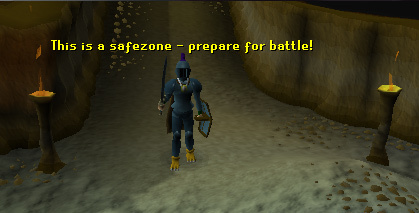 Some players might want to use Prayer-boosting gear and use Protect From Melee to kill the warriors and giants without food. The nearby altar also allows players to "flash" (use a Prayer only when you are about to hit a target or get hit by a target) medium level offensive prayers (such as Superhuman Strength). It is always good to have some Prayer available however in case you run into a PKer. Again, the altar is located in a multi-combat zone so proceed at your own risk. The big drawback to this area is of course that it is in the Wilderness. Do not be discouraged by that, however. It is rarely visited by anyone, and most of the visitors are trainers or new players adventuring. 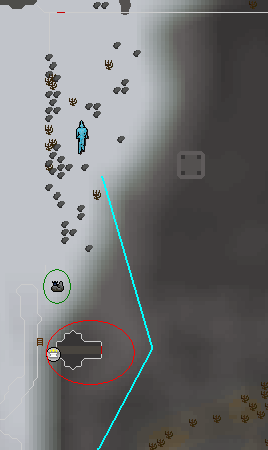 Even if a PKer does come by, your white dot will be camouflaged by the snow on the minimap and it will be hard for him or her to attack you because the area is full of monsters who will attack the PKer, not letting the PKer attack you. The area is about a 7-10 minute round trip to Edgeville walking. When you are low on but not out of food, consider banking. Walking straight down will land you just north of Goblin Village. When you are fighting them, don't run away if they hit high on you. Just have some of your food and continue fighting. If they continually hit high on you, get better food, or your Defence level/armor is not good enough. If you are on a member's server, you don't need to pray. 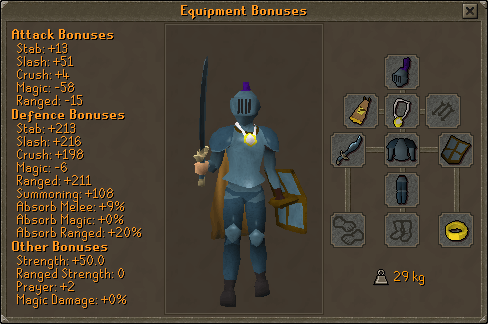 If you are a member your combat should be pretty high and you probably won't even need member armor. Remember, this guide is meant for medium-level non-members. If you die, don't get your head down. Train on other monsters for now and get those levels up! They look pretty scary! But don't be intimidated - You have food and armor; they got a sword. Most importantly, don't give up. If you give up as soon as you kill one and are almost out of food, bring better food, get your levels up and eventually you will be training on Lesser Demons!